Want to know more about Kurdistan? The number of Kurds in the four parts of Kurdistan and within the borders of the four countries that have divided it up between themselves totals about 52 million. This makes the Kurds, one of the largest nation in the Near East or Middle East, like Persians, Israelis, Arabs, turks, etc and if not more in case of population size. 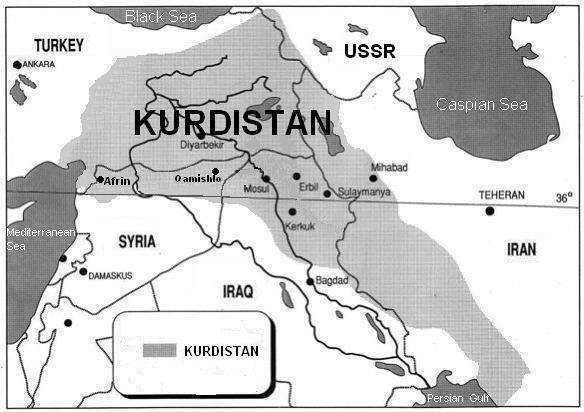 Kurdistan, which has since time immemorial been inhabited by the Kurds, has a territory of 500,000 square km, which is as large as that of France (for this purpose I have published few maps below). In other words, the Kurds are not a minority in their country; they are the majority. The Kurdish question is not the problem of a minority of the population of this or that country; it is the question of a divided and illegally occupied country and an oppressed nation. Like all other nations, the Kurdistani too have the right to self-determination. 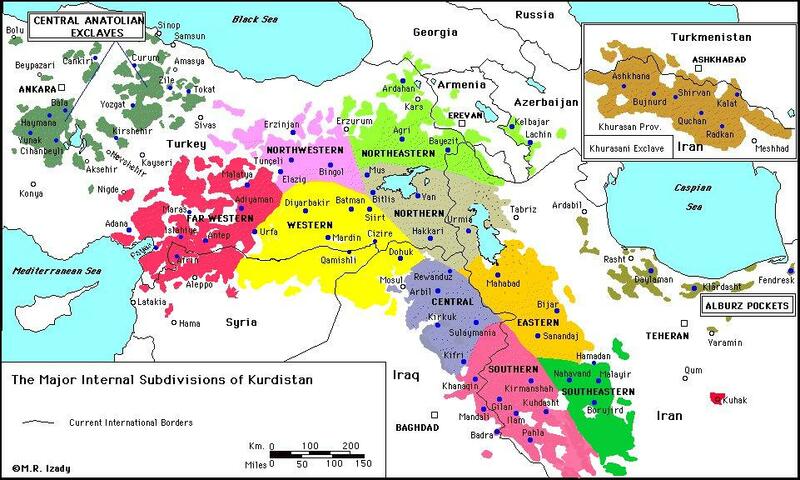 The borders that divide Kurdistan are neither natural, economic, nor cultural borders. They are artificial borders that have been drawn against the will of the Kurdish people according to the interests of the forces that did the dividing and the balance of power. In many cases these borders have divided villages, towns, even families, and have had divisive and destructive effects on economic, social, and cultural life. The largest part of Kurdistan, which in terms of both its population and its territory makes up about one-half of the total, lies in the north inside the state borders of Turkey. This part amounts to one-third of the total territory of Turkey, and includes more than twenty provinces in the "eastern and northeastern regions". 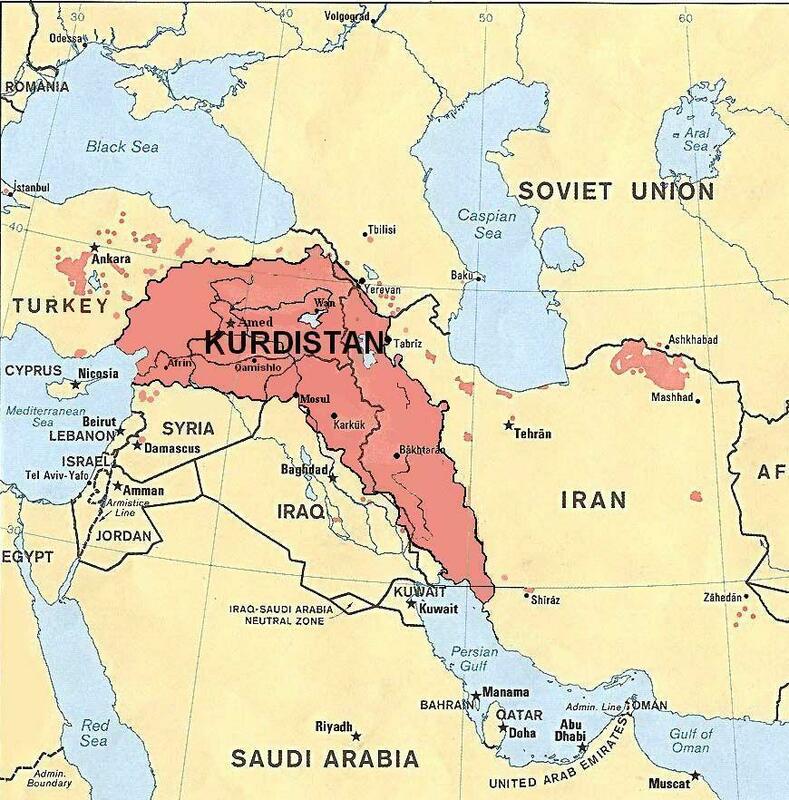 Other parts, according to their size, are eastern Kurdistan (within the borders of Iran), southern Kurdistan (within the borders of Iraq), and Southwestern Kurdistan ( within the borders of Syria ). In all of these parts a large number of the inhabitants - between 85 and 95% - are Kurds. A certain proportion of the Kurds have lived since earlier times, or because of the migrations and refugee movements of recent times, in other regions and in the large cities of these countries. 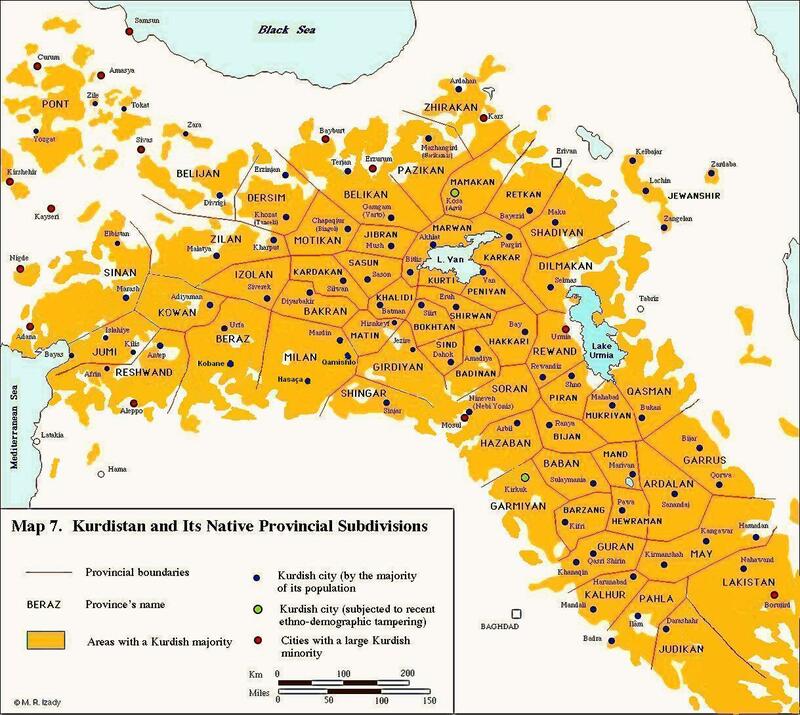 If we count these as well, then about 24 million Kurds live in Northern Kurdistan [ Kurdistan ], 12 million in Eastern Kurdistan [ Iran ], 8 million in Southern Kurdistan [ Iraq ], and 4 million in Western Kurdistan [ Syria ]. Being the native inhabitants of their land. there are no "beginnings" for Kurdish history and people. Kurds and their history are the end products of thousands of years of continuous internal evolution and assimilation of new peoples and ideas introduced sporadically into their land. Genetically, Kurds are the descendants of all those who ever came to settle in Kurdistan, and not any one of them. A people such as the Guti, Kurti. 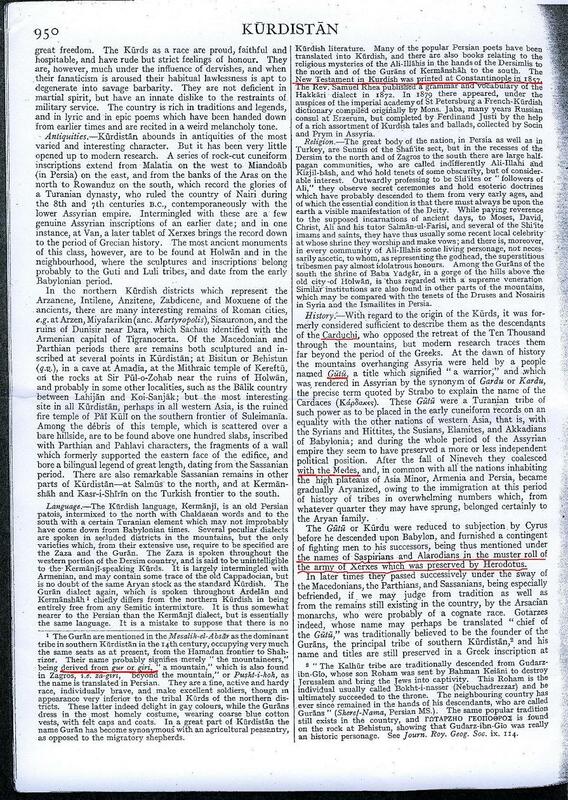 Mede, Mard, Carduchi, Gordyene, Adianbene, Zila and Khaldi signify not the ancestor of the Kurds but only an ancestor. Archaeological finds continue to document that some of mankind's earliest steps towards development of agnculture. domes- tication of many common farm animals (sheep, goats, hogs and dogs). record keep- ing (the token system), development of domestic technologies (weavmg, fired pot- tery making and glazing), metallurgy and urbanization took place in Kurdistan, dating back between 12,000 and 8.000 years ago. Kurds are speakers of Kurdish, a member of the northwestern subdivision of the Iranic branch of the Indo-Europian family of languages, which is akin to Persian, and by extension to other Europian languages. It is fundamentally different from Semetic Arabic and Altaic Turkish. 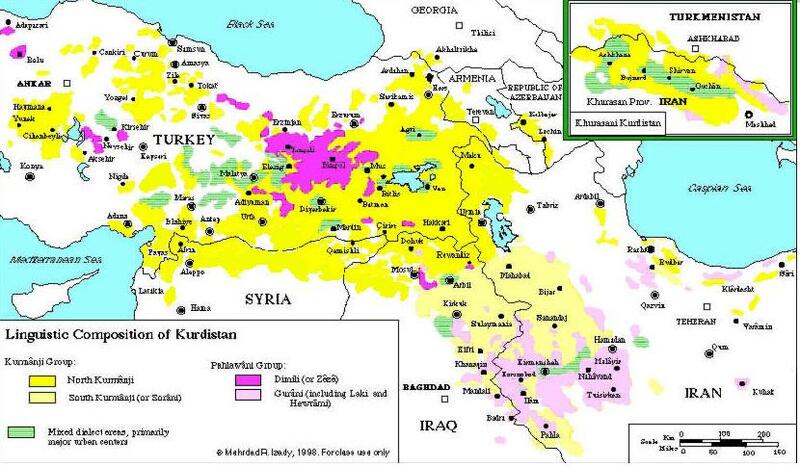 Modern Kurdish divides into two major groups: 1) the Kurmanji group and, 2) the Dimili-Gurani group [ See below for more detials in the Map]. These are supplemented by scores of sub-dialects as well. The most popular vernacular is that of Kurmanji(or Kirmancha), spoken by about three-quarters of the Kurds today. Kurmanji divided into North Kurmanji(also called Bahdinani, with around 20 million speakers, primarily in central and North Western Kurdistan and the former Soviet Union) and South Kurmanji(also called Sorani, with about 12 million speakers, primarily in South Eastern Kurdistan). In the far Southern Kurdistan, ( Iraq and Iran ), the Gurani dialect is spoken by about 3 million Kurds. 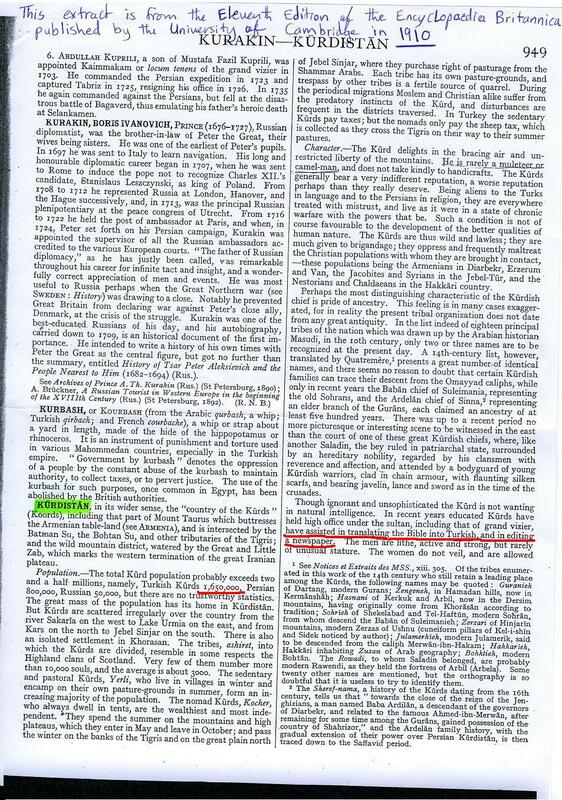 Gurani along with its two major subdivisions: Laki and Awramani, merit special attention for its wealth of sacred and secular literature stretching over a millennium. The Kurds: A Concise Handbook by Mehrdad R. Izady (This information should not be considered as a 'fact'---The KIN). In South and Eastern Kurdistan ( Iraq and Iran ) a modified version of the Perso-Arabic alphabet has been adapted to South Kurmani(Sorani). The Kurds of Northern( Turkey ) have recently embarked on an extensive campaign of publication in the North Kurmanji dialect of Kurmaji (Bahdinani) from their publishing houses in Europe. these employed a modified form of the Latin alphabet. The Kurds of the former Soviet Union first began writing Kurdish in the Armenian alphabet in the 1920s, followed by Latin in 1927 , then Cyrillic in 1945, and now in both Cyrilic and Latin. Gurani dialects continue to employ the Persian alphabet without any change. 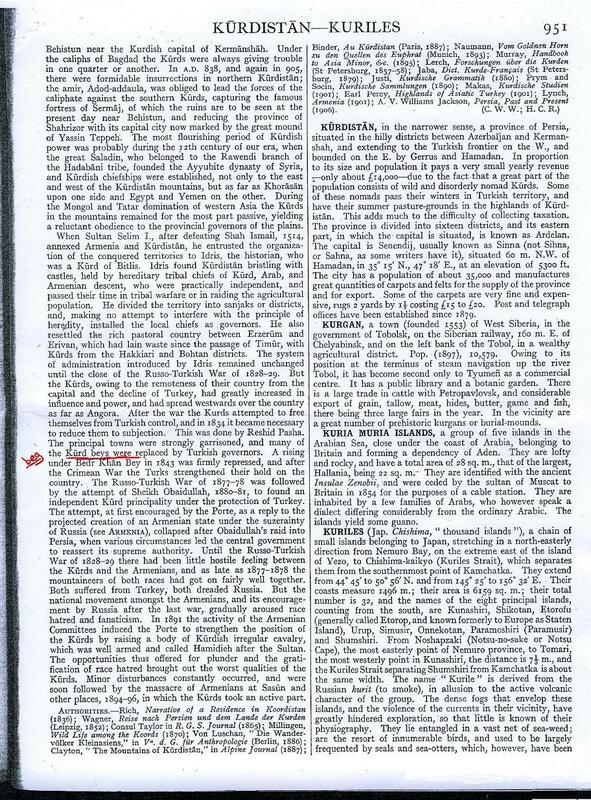 Dimili now uses the same modified Latin alphabet as North Kurmanji for print. names and terms has been fully maintained here. In Northern Kurdistan almost 20 million Kurds are forbidden to use their own language or to describe themselves as Kurds or Kurdistani, on pain of imprisonment Kurds are officially known as "Mountain Turks". In the 1920s and 1930s Kurds rebelled against this discrimination, and the government suppressed them with great ferocity deporting thousands from their homeland. The continued stringent suppression of over 20 million people has resulted in the rise of a Marxist guerrilla group. 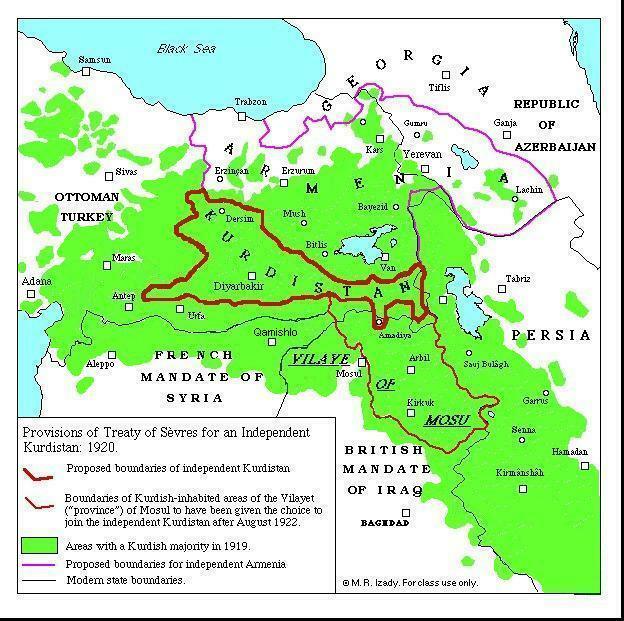 In Eastern Kurdistan the Kurds were similarly brought under control in the 1920s. In 1946 the Kurds of Mahabad succeeded in declaring an independent republic, but it only lasted a few months, and the authorities hanged the ringleaders. Tribal chiefs were allowed to register tribal lands as personal possessions and were welcomed into the Iranian ruling elite, in return for making sure their tribes obeyed the government. 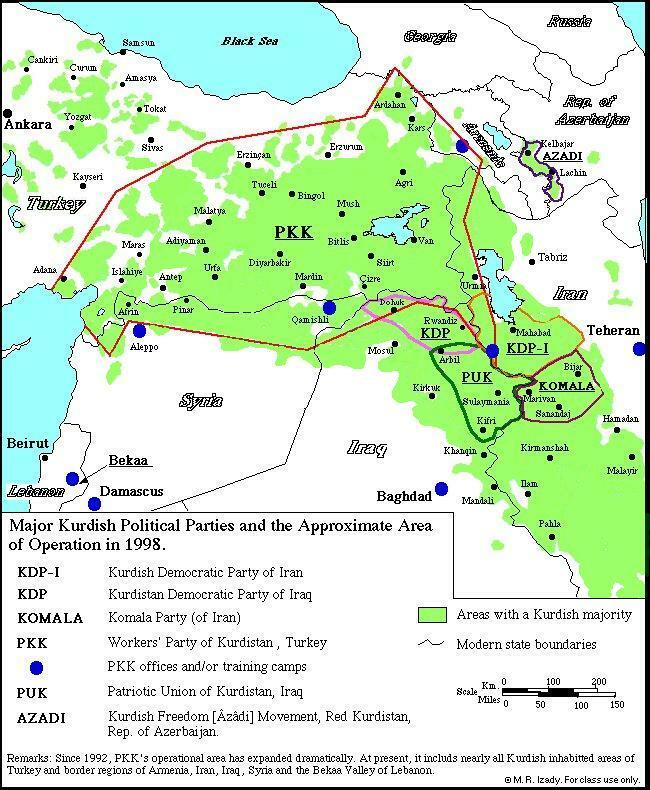 After the shia revolution the Kurdistan Democratic Party of Iran (KDPI) rebelled after demands for autonomy were refused by Tehran. There were numerous revolts against Baghdad, mainly by Mullah Mustafa Barzani, the famous leader of the Kurdistan Democratic Party of Iraq (KDP). From 1964 until 1975 Barzani was strong enough to maintain an intermittent state of war and peace negotiations. In 1974 the governing Ba'th party offered the Kurds autonomy, but the Kurds believed it lacked substance and they reverted to war, strongly supported and encouraged by Iran. But In 1975 the Shah of Iran, who had supported Barzani, signed the Agreement of Algiers with the Iraqi government and abandoned the Iraqi Kurds to their fate; as a result the Kurdish resistance virtually collapsed. In the years that followed, many of the achievements of 1970 were gradually whittled down by the Iraqi authorities. In view of the repeated brutal attacks on Kurdish civilians after the end of the Iran-Iraq war (e.g. Halabja, March 1988), and the forced resettlements of parts of the Kurdish population (1989), it seems unlikely that the atmosphere in Iraq will be conducive to worthwhile literary activities in the near future. 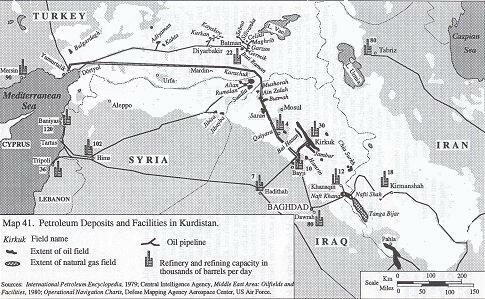 At the time of writing, it is impossible to predict the effects of the 1991 Gulf War on the position of the Kurds of Iraq. The successes of the Iraqi Kurds in the field of language and education have, however, enabled them to create an impressive literature and a fully adequate written language, and have produced a generation of Kurds whose primary and secondary education have been in Kurdish. Such achievements will undoubtedly help the Kurds of Iraq in their future efforts to preserve their cultural and ethnic identity. The Syrian Ba'ath Party is not very different from the Iraqi brutial regime of Saddam, in its suppression of kurds. It has a long history of terror and brutality against the Kurdish people. Syria has the worst and highest record of human right violation in the region particularly towards Kurds. Many massacre and genocide have been committed against Kurdistanis. The government did not only murdered the kurds, but also have forbidden the Kurdish Language in education. In additton to all of those dirty crimes, it confiscated the kurdish land and distributed it to the Arab settlers, the policy of Arabization is still being carried out until this moment by Syrain regime. Because of migration and refugee movements, Kurdish communities have also been formed in North America and Australia. Although there has not been any official statistic on kurdish population in these continents, but thier number are in hunderds of thousands.